Did you ever have a slumber party as a child? 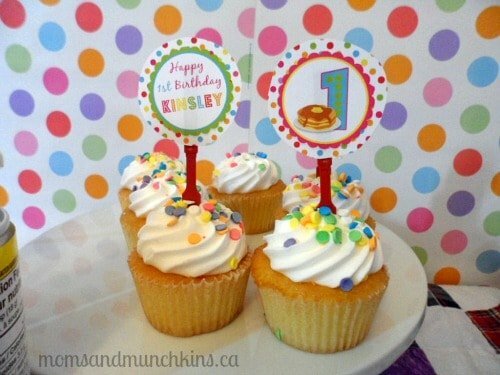 How about a birthday party held over brunch with pancakes instead of cupcakes? 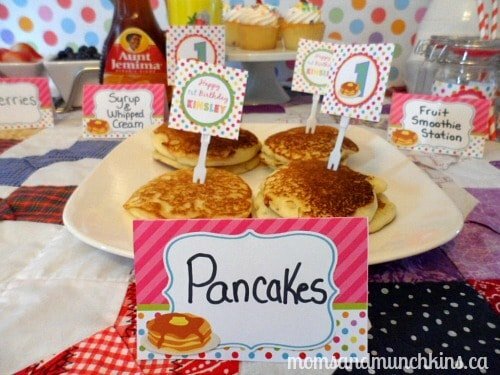 These fun Pancake and Pajama Party ideas are perfect for anytime of day. With food like pancakes, berries, syrup and whipped cream, how can you go wrong?! Here I’ll share ideas with you for decorations, food, games and treat bags. All of the printables featured here are by Dazzle Expressions. A invitation in a slumber party theme is perfect for an evening party while an invitation featuring pancakes is perfect for a brunch themed party. In the invitation, be sure to invite guests to attend the party wearing their favorite pair of pajamas. You could award prizes for some of the best pajamas – like the most original, most worn out, boldest colors, etc. 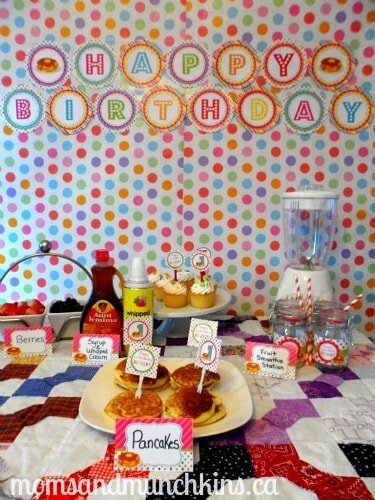 When decorating for your Pancake and Pajama Party, you’ll want to keep things looking bright and cozy. Some fun ideas include using a quilt as a tablecloth (like the beautiful one featured above that my Grandma made for me), bright polka dots, pillows around the party area, sleeping bags to sit on, sock slippers for everyone to wear and a personalized banner. Click here to view the entire party printable set from Dazzle Expressions. Even if your Pancake and Pajama Party is in the middle of the day, fun activity ideas include typical slumber party games like a pillow fight (a gentle one! 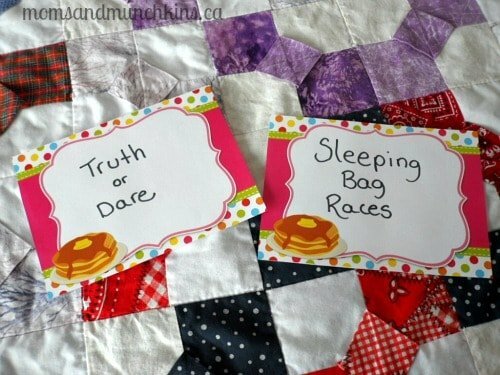 ), sleeping bag races and a family-friendly version of truth-or-dare (here’s a free printable). 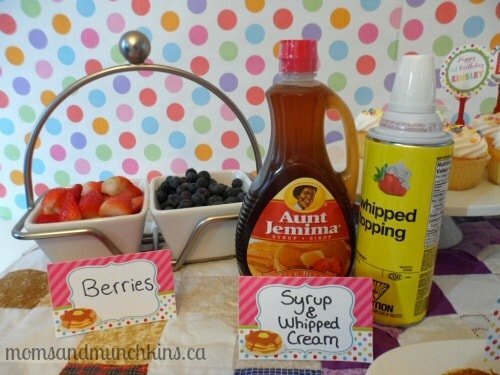 With pancakes, there are so many different variations of flavors and toppings that you can easily create a pancake buffet. Simply use your favorite pancake mix and add in different combinations to create a variety of pancakes (bananas, chocolate chips, coconut, apple pie filling, etc.). Toppings could include chocolate coated candies, berries, whipped cream, different syrup flavors and butter. If you’d like to serve other breakfast foods in addition to pancakes, here is a delicious recipe for homemade waffles. 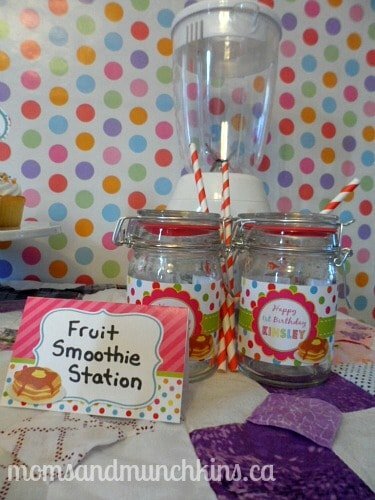 For party drinks, you could use juice boxes, mason jars with milk or even create a fruit smoothie station with fresh berries, yogurt and a blender. For a completely unique cake for a Pancake and Pajama Party, you have to check out this cake on MommyMoment.ca that looks just like a stack of pancakes. It’s pretty incredible! Another great thing about a Pancake and Pajama Party is that you don’t have to serve traditional cake or cupcakes. Your dessert could be chocolate chip pancakes topped with berries and whipped cream or stay within the breakfast theme while serving berry crepes. The possibilities are endless! If you decide to have traditional dessert, these cute cupcake toppers and different colors of icing confetti help to tie the theme together. small products like hand lotions, face masks, nail polish, travel toothbrush sets, etc. 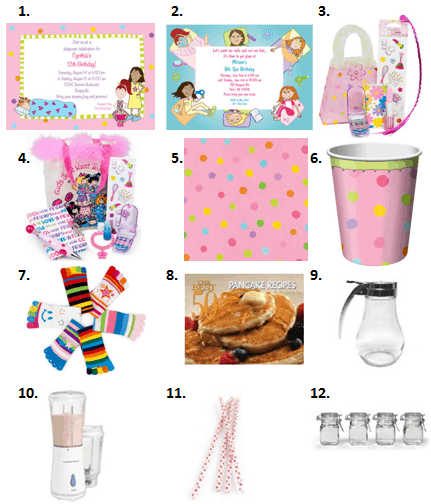 Visit our special Slumber Party category for even more fun ideas! 9. Tablecraft Products Honey/Syrup Dispenser 14 Oz. We’re always adding new party ideas! Stay updated on the latest ideas by following us on Facebook, Twitter, Pinterest and Bloglovin’. *Disclosure: Dazzle Expressions provided me with this party package free of charge. I am an affiliate with Amazon and Birthday in a Box. All opinions expressed here are my own.